Earlier this month, I couldn’t quite grok the fact that my friend and neighbor James harvested 98 limes from his deck-cultivated, in-container dwarf tree. Serious citrus in the Santa Cruz mountains? From a deck? 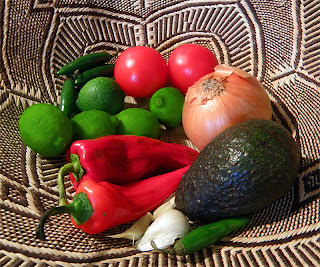 But as a result, we were blessed with over a dozen limes, which I’d said I could use to make chili lime chicken soup. “I’d like that recipe,” responded James, a lover of all spicy foods. But actually, there was no recipe, just a vague recollection of a delicious soup sold by the now-defunct Lunch Box, which used to deliver lunches and goodies to my day job. I remembered that it was a simple soup with numerous toppings that could be added to tweak the flavor. So I proceeded with the experiment. My first attempt was given the seal of approval (ie. was nearly polished off) at our monthly game night potluck. And so, by special request…a recipe for game night host James. Unlike most soups, which you can cook the heck out of and they taste fine, the lime in this one will start tasting bitter and non-limey if soup is overcooked. Check it at 45 minutes, and continue cooking only if chicken isn’t done. If you do overcook it (not saying that I did, dum-dee-dum-dum), you can squeeze in more fresh lime juice to perk it up, and a bit of extra grey salt to balance the bitterness. The soup itself is light and a foil for the richer toppings. Besides the chili and lime, the idea is light chicken flavor complimented by slight sweetness from tomatoes and sweet red pepper. I prefer to use bone-in chicken breasts for a bit more flavor (plus their lower cost,) but you could substitute 1 lb. of boneless skinless breasts. The rest of the flavor comes from Staff of Life’s Chili Mex spice mix, which they’ve been carrying for at least 30 years. 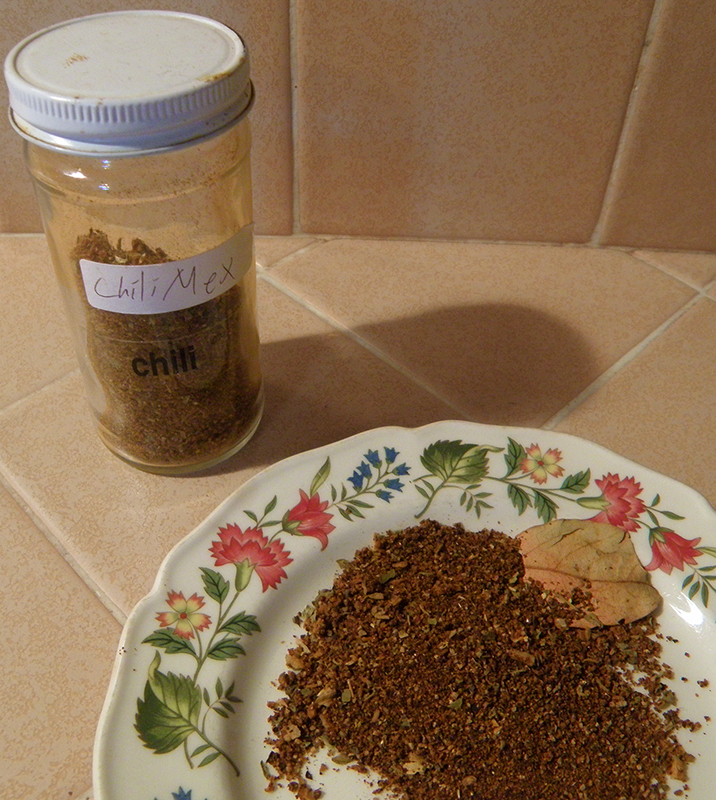 For readers outside of the Santa Cruz area (or who can’t get over to Staff at the moment), I’ve provided a reasonable substitute below, using chili powder, oregano, cumin, and bay leaf. Again, the idea is light spicing, so that the lime can dominate the flavor. A word about jalapenos: they vary in size and hotness. We used small ones, hence the 4 – 6 quantity. If your jalapenos are large, start with about 3. As usual, if you don’t know how hot the chilis will make the soup, try adding a few at a time. We started with 4 (small), then tested the soup after about 15 minutes of simmering. At that point we added 2 more and retested in 15 minutes. (I am saying “we” because Bruce not only participated in assessing the heat factor, but also kindly chopped the jalapenos.) This seemed sufficient, although the extra jalapenos disappeared at the potluck, so I might add more next time, or add seeds to the soup. Jalapeno seeds will definitely increase the hot chili effect. 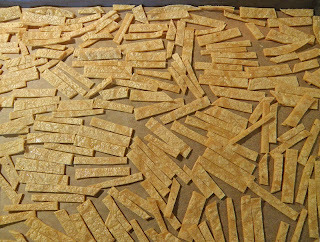 The biggest improvement I made to the recipe is freshly-baked tortilla chips. Forget the over-salted, over-oily packaged version, which adds too-heavy (salt and oil) flavor. There’s plenty of time to make your own while the soup is simmering. 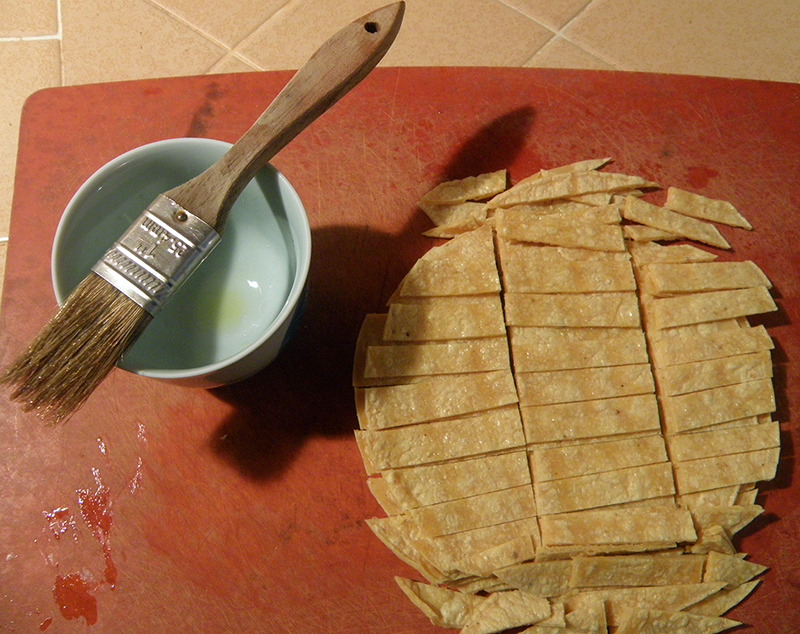 Some people stack up 4 tortillas and cut strips through the entire stack, but I found it most practical to slice up only 2 at a time…the olive oil makes them slippery. It’s not unlikely that you’re more coordinated than I am though, so see what quantity works for you. This soup is perfect for warming up on a cold late fall night, like tonight. The topping tray makes an impressive presentation at potlucks, though I can’t show you a photo at the moment because my fellow gamers made short work of it, the ultimate compliment to a cook. I’ll post a photo of your topping tray if you email it to me (seasonaleating [at] gmail.com). Enjoy, and stay warm! Remove skin from chicken breasts. Dice onion into ½ inch pieces. Heat skillet over medium high heat and coat bottom thinly with about 1 tsp. olive oil. Add onion and cook until onions start to get golden, about 3 – 4 minutes, stirring often. Remove from heat. Chop tomatoes into medium size chunks and do not discard liquid or seeds. Cut sweet red peppers into thin strips. Using gloves or cutting with knife and fork, remove seeds from jalapenos and cut into small strips. You could choose instead to add some of the seeds to the soup—if you like it hot. 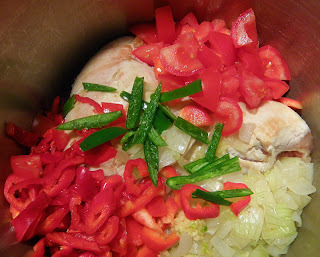 Add chicken, onions, garlic, red peppers, jalapenos, chili Mex mix, chicken stock, lime juice, and 1 teaspoon grey salt to 4-quart soup pot. Bring to boil. Simmer for about 45 - 50 minutes, until chicken is cooked through. 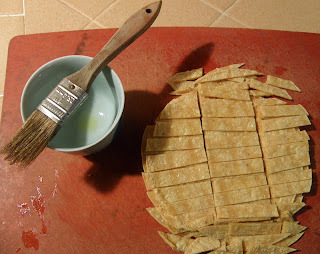 Preheat oven to 350 degrees F. Brush tortillas with olive oil on one side. 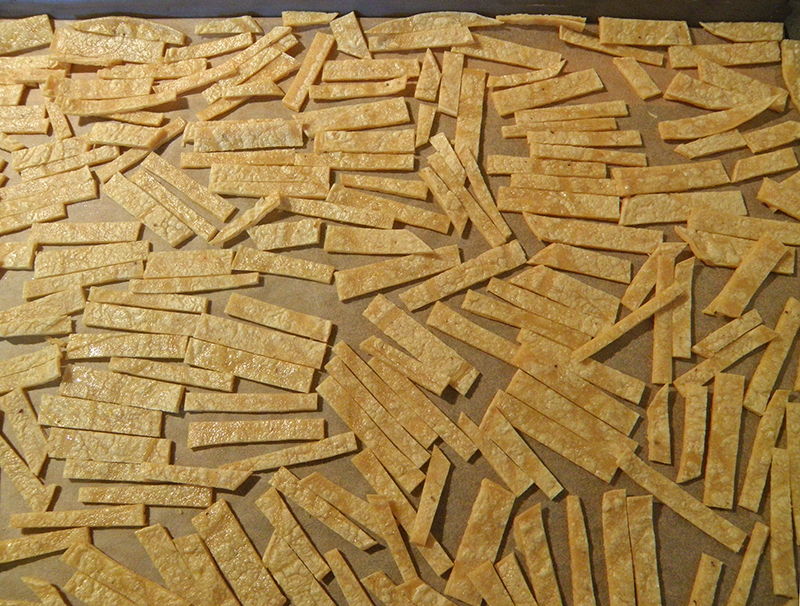 Stack up two tortillas and cut into thin strips (about 3/8 inch x 1¼ inch). Place strips on baking sheet close together but not overlapping. Sprinkle with about ½ teaspoon salt. Bake until lightly golden brown, about 12 – 15 minutes. Check at about 6 minutes to be sure they’re baking evenly; if not, rotate pan 180 degrees. Remove from oven and cool. Dice avocados into 1-inch chunks. Sprinkle with lime juice to prevent them from browning. Cut extra limes into wedges. Cut extra jalapenos into rounds, without removing seeds. Pile toppings onto plate to serve with soup. Put jalapenos into separate cup or dish. When chicken is cooked, remove soup from heat. Remove chicken from soup to cool. When cool enough to handle, remove chicken from bones. Shred or cut into bite-sized pieces. Return chicken to soup pot. Season soup to taste with grey salt (or powdered chicken bouillon). Reheat gently if necessary. 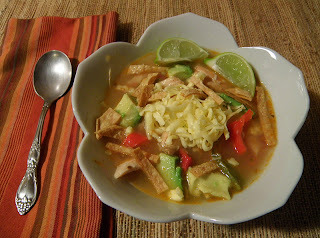 Ladle soup into bowls and let diners “top their own” with tortilla strips, cheese, avocado, extra lime, and/or jalapenos. 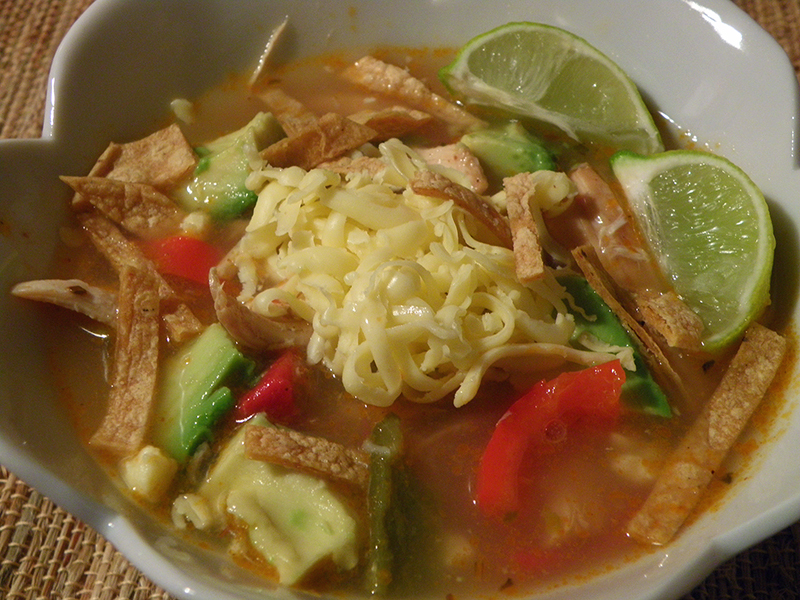 As the above-mentioned "game-night host," I must say the soup was lovely, and the lime did, indeed, stand out. Thanks, Robin! A word about jalapenos: the longer they steep in a broth of any kind, the hotter the broth will become, so if you have soup leftovers, know that they will be spicier than they were initially. As Robin notes, lime juice can become bitter tasting if cooked too long. I tend to add lime juice near the end of the cooking process to preserve its maximum flavor.